proprietary elements of vibrant blown glass and solid brass and copper accents. own distinctive finials that enhance these uniquely fabricated pieces. 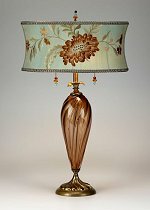 The table lamp, Monica, features soft brown blown glass and a soft blue oval silk shade with embroidered rust colored floral design. The solid brass and copper elements are finished with techniques that will ensure they will never chip or discolor. Beaded pulls and finial. Double socket - Uses two 60-watt maximum bulbs (40-watt bulbs included) Height (w/o finial): 27 inches / 68,5 cm Shade height: 8 inches / 20,3 cm Shade: 12 x 12 inches w/d / 30,5 x 30,5 cm Free UPS Ground Shipping Handmade in the USA Created by Susan & Caryn Kinzig The nature of these processes and materials makes each lamp distinctive and no two lamps will be exactly alike. Sorry - Currently Out of Stock!Drop Ship May be Available! 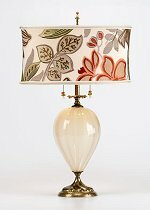 The floor lamp, Aaron, features two ruby and brown hand blown glass pieces in the stem, with a round burgundy, salmon, and taupe shade, in an embroidered abstract floral silk design... The solid brass and copper elements are finished with techniques that will ensure they will never chip or discolor. Double socket - Uses two 60-watt maximum bulbs (40-watt bulbs included) Height (w/o finial): 62 inches / 157,5 cm Shade height: 10 inches / 25,4 cm Shade: 18 x 18 inches w/d / 46,0 x 46,0 cm Free UPS Ground Shipping Handmade in the USA Created by Susan & Caryn Kinzig The nature of these processes and materials makes each lamp distinctive and no two lamps will be exactly alike. In Stock - Ships Immediately! 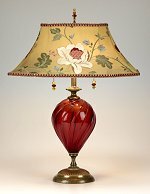 The Frida table lamp has deep red colored blown glass base; a large rectangular shade covered in Red, Gold, Green and Salmon material with a beaded pull and finial. Double socket - Uses two 60-watt maximum bulbs (40-watt bulbs included) Height (w/o finial): 26 inches / 66,0 cm Shade height: 8 inches / 20,4 cm Shade: 19 x 17 inches / 48,0 x 43,0 cm Free UPS Ground Shipping Handmade in the USA Created by Susan & Caryn Kinzig The nature of these processes and materials makes each lamp distinctive and no two lamps will be exactly alike. Special Order - Allow 3-4 weeks! The Jacqui table lamp is made from solid brass and copper elements that are finished with techniques that will ensure they will never chip or discolor. Base is creme colored artisan blown glass while the shade is oval with shades of green, gold & purple embroidered silk. Double socket - Uses two 60-watt maximum bulbs (40-watt bulbs included) Height (w/o finial): 26 inches / 66,0 cm Shade height: 9 inches / 23,0 cm Shade: 17-1/2 x 12 inches / 44,5 x 30,5 cm Free UPS Ground Shipping Handmade in the USA Created by Susan & Caryn Kinzig The nature of these processes and materials makes each lamp distinctive and no two lamps will be exactly alike. Special Order - Allow 3-4 weeks! 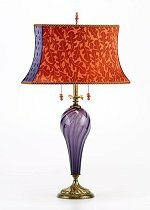 The Candace table lamp features a unique burgundy rust-colored leaf pattern and purple polka dot shade. The base is purple colored blown glass with copper and brass elements that will not fade or chip. Double socket - Uses two 60-watt maximum bulbs (40-watt bulbs included) Height (w/o finial): 29-1/2 inches / 75,0 cm Shade height: 10 inches / 26,0 cm Shade: 18 x 13 inches / 46,0 x 33,0 cm Free UPS Ground Shipping Handmade in the USA Created by Susan & Caryn Kinzig The nature of these processes and materials makes each lamp distinctive and no two lamps will be exactly alike. Special Order - Allow 3-4 weeks!